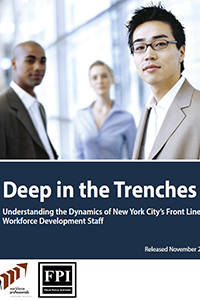 As part of our mission to enhance the capacity of the workforce development field, WPTI periodically publishes research reports and practice guides that distill best practices. Workforce professionals help prepare job seekers and place them in suitable positions. 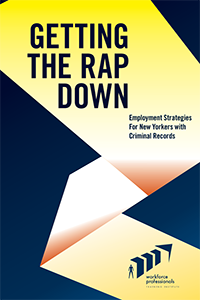 These professionals assess the job readiness of job seekers; provide career coaching, job preparation, and vocational training; work with employers to identify job openings, match job seekers with openings; and monitor those placements to improve job retention. Finding jobs for young New Yorkers is challenging in the best of times. 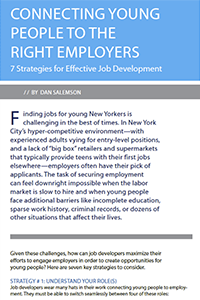 In New York City’s hyper-competitive environment—with experienced adults vying for entry-level positions, and a lack of “big box” retailers and supermarkets that typically provide teens with their first jobs elsewhere—employers often have their pick of applicants. 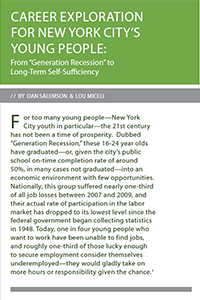 For too many young people—New York City youth in particular—the 21st century has not been a time of prosperity. 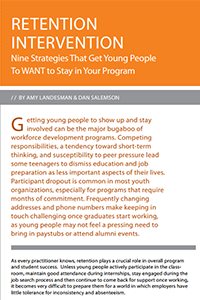 Dubbed “Generation Recession,” these 16-24 year olds have graduated—or, given the city’s public school on-time completion rate of around 50%, in many cases not graduated—into an economic environment with few opportunities.